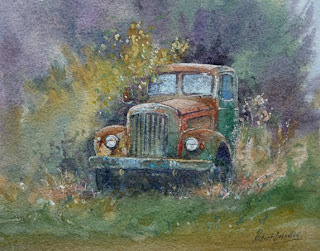 I have just returned from a 4 day workshop in Rutland. We managed to paint and sketch outdoors every day and these two painting were my 'on-site' demonstrations. The 'Morris Commercial' lorry was found on a small farm in the Village of Ayston and has been there for many years. The rust, flaking paint and lichen made this an interesting textural subject. 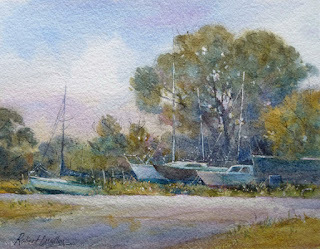 The painting, 'Boats / Rutland Sailing Club', proved to be a demanding exercise in blustery, cold weather conditions. Thanks again to all the artists who attended, for making me so welcome. I hope to meet you all again next year!